A couple of weeks ago I wrote a post about how you can use the Photoshop Notes tool to collaborate and share your images. If youâ€™re not using Photoshop and youâ€™d like to do something similar, then FineTuna is the web app for you. So how does it work? Well it couldnâ€™t be simpler. You pick an image from your computer or an image on the web, upload it and add some of your comments. Now you either send your image and comments on by email or you can copy and paste a link to a client or friend. Taking a closer look at the interface, when you upload your image, it will appear onscreen with a couple of options on the toolbar along the top. You can drag the image around, and one feature that I really love is the ability to draw or scribble on to your image. Great for quickly circling areas on the image or doodling arrows. You can add notes by clicking on the Note button, which opens a small speech bubble where you add your notes. Click Save and voila! Notes added. Think about the time you could save getting feedback on a logo, for instance. And without having to see the client face to face or go back and forth with what can sometimes seem like endless emails. Itâ€™s very quick and very easy. 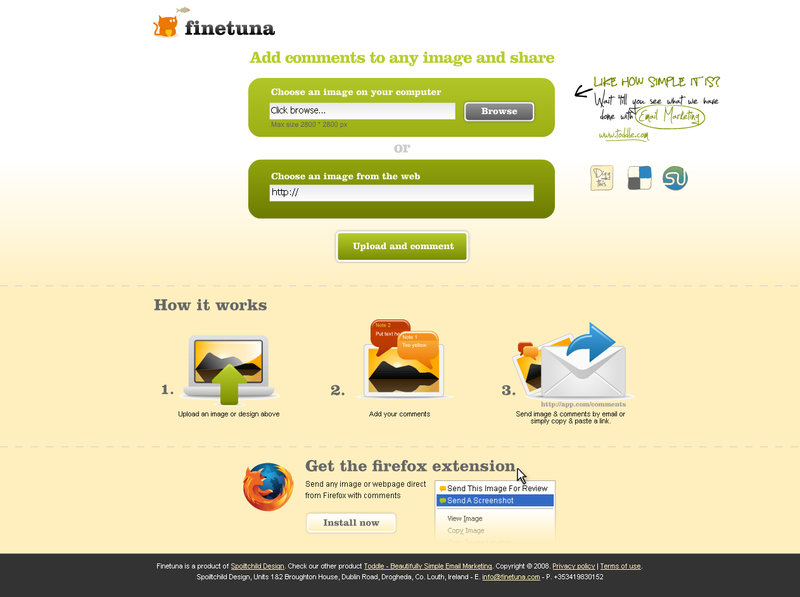 FineTuna is also available as a Firefox extension. Once the plugin is installed, you can send an image for review or a screengrab of an entire web page by right-clicking on the image or page. Easy-peasy-lemon-squeezy. There is no sign-up involved with FineTuna, it is completely free, there are no ads and I would say a â€œmust be bookmarkedâ€�, genuinely useful app for designers. Have you tried out this app or anything similar? Did you find it useful?